Nothing feels better than rinsing away the old and trying on the new. Since dust can settle anywhere, even on websites, a little “spring” cleaning can help brighten a virtual space and attract new visitors. 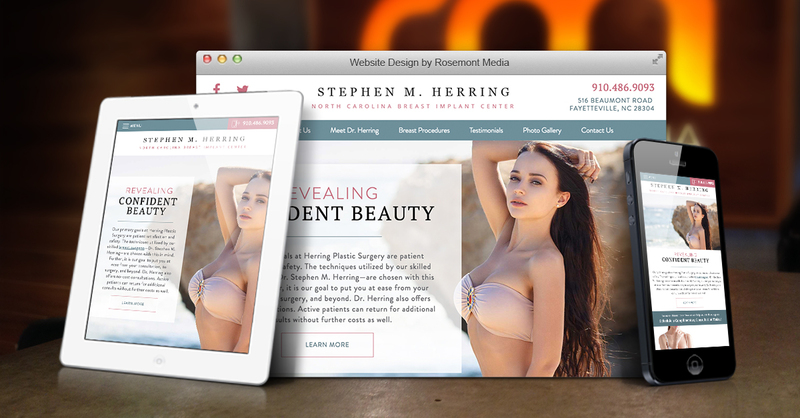 That was the goal for Dr. Stephen Herring and his specialty website, North Carolina Breast Implant Center. The Fayetteville plastic surgeon had a lovely site complete with the basics—all it needed was a fresh coat of paint, so to speak. So, our team modernized the responsive design, updating the layout and improving the navigation for a more user-friendly experience. Patient reviews can be found sprinkled throughout the content, as well as on their own dedicated page. With its clean lines and soft color palette, the before-and-after photo gallery is an inviting resource for patients considering breast surgery. The minimalist approach offers maximum impact and, most important of all, updated medical SEO strategies help to ensure a top spot on search engine result pages. After all, what’s the point of tidying if no one sees your hard work? Check out what a simple sudsing can do to transform a practice site by clicking over to www.northcarolinabreastimplantcenter.com. And if you’re curious how we can make your website shine like new, just give us a call.